Influential musicians Mike Williams (Eyehategod), Scott Kelly (Neurosis), Bruce Lamont (Yakuza) and Sanford Parker (Minsk) have come together to form the new, collaborative project Corrections House. While they have brought in elements of each of their backgrounds, the band have created a unique, unexpected sound, as displayed on their brilliant full-length debut, Last City Zero. The album features a dominant industrial influence, as well as elements of droning noise and doom, while maintaining an extremely dark, brooding atmosphere throughout. In a recent interview, vocalist Williams discussed how Corrections House came to be, why he wouldn't call it a "supergroup" and the recording process for Last City Zero. He also talked about the band's difficult to categorize sound, the theme behind the record and his lyrical approach, as well as how life's struggles yield the best art. It's really cool to hear you, Scott Kelly, Bruce Lamont and Sanford Parker coming together. 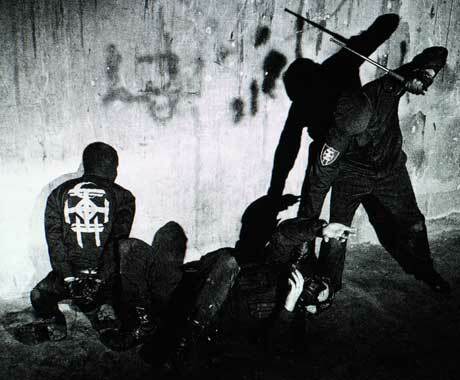 How and when did Corrections House come about? It's a strange thing, it kind of just came about by itself really, it's kind of confusing. I mean, we all knew each other and we had done different projects, like I had been doing these noise shows, these power-electronic shows where Bruce would just do noise and I would just scream over it, or read over it and things like that. And Bruce had been doing stuff with Scott, with Scott's acoustic stuff. So, it was just this natural thing. We did a tour last year and it was four solo sets, we all did solo things, like I read, Scott played acoustic, Bruce did a saxophone thing. But that was the original idea, it was just to have Scott open for me and Bruce doing the noise thing, and then Sanford Parker actually wrote some songs and they all came up with these riffs and songs for the first seven-inch we did. It kind of just went from there, we didn't really have it planned out, like "Hey, let's start a band." We never even said that, it was just the solo set thing turned into this group where we actually had songs. So, it kind of just manifested itself from there. You're all such influential musicians in your own right, so of course you get the "supergroup" tag. How do you feel about that? I hate that, I hate the supergroup tag. Everybody always has to label things, you know? I mean, I understand as a writer, I've done it myself, I've done rock journalist stuff, and you have to kind of put labels on things sometimes. But supergroup is probably the worst one, I think. It doesn't make any sense. Just because we're all in other bands, why is it a supergroup? I thought a supergroup was like when Robert Plant plays with Tony Iommi or something like that, you know? That would be a supergroup to me, like huge rock stars or whatever. We're just guys doing what we do, I don't see how it fits us, but if people want to call us that, I don't care. Each member comes from a different sub-genre within heavy music, but Last City Zero is really different from all of your other bands. Was that intentional? Or did it come naturally when you all started jamming together? Yeah, see that's the thing, it just came naturally. I mean, we didn't plan for this to be a band at all, like a band with actual songs. We were just going to do, like I said, the solo things. We were going to do a tour and then it just came from that, but nothing was planned out at all. I mean, we didn't even rehearse together in the same room until the day before the tour, it was the first time we were all together in a room [laughs]. We had done the seven-inch, but we did our parts separately, like Scott did his stuff and I had flown up to Chicago and did vocals with Sanford, and everybody did their own thing and kind of put it together. So it was definitely unintentional, we didn't know what it was going to sound like. We knew we wanted to do something different, but we didn't know what that was going to be at all, it just evolved like that. What was the writing and recording process like for Last City Zero? Well, it started out here where I live. I live like an hour from New Orleans, above Phil Anselmo's studio. He's got a studio downstairs, that's why there's a band playing right now, actually the band Down are there right now writing their new record. They just woke me up as a matter of fact. So it started here, Corrections House were on tour doing the thing with the solo sets and then we would do the three songs at the end that we had put together very quickly [laughs]. But we were doing that tour and we played New Orleans, so passing through New Orleans we came and stayed out here. Everybody, Scott, Bruce, Sanford, they came and crashed until we headed to the next show. And there's a studio here, and it was just one of those boring days, so they were just like, "Let's put some stuff down." And Scott just threw down some riffs that he either had or just made up on the spot, like some heavy stuff, and that was kind of the basis for it. We recorded those tracks and from there Sanford took that stuff and added some electronics to it and drum machine stuff and things like that, you know, synthesizer stuff. Bruce then added to it, did his thing, and some vocals or whatever and then I went up there for like three or four days and did the vocals, then Bruce did some more vocals. So that's how it came together. It's a difficult sound to categorize, how would you describe Corrections House? I have not found a way to describe it, I don't know how to describe it to people. I mean, if I had to, like if I was a writer, writing a story about this band, I guess I would have to says it's got industrial elements. Industrial use to be this thing that was like Throbbing Gristle or SPK, Nurse With Wound and bands like that, but then it kind of became the whole Wax Trax [Records] sound, like Ministry and all those bands. But I think there's elements of both of those types of industrial music, just the elements. And I don't know, there some gothic stuff on there, there's one song that Bruce sings, "Run Through the Night," it's kind of gothic, I would say Swans kind of stuff, later Swans, you know? And it's mechanical sounding a lot of it, but there's also organic elements too. I mean, with Scott's vocals and guitar, just the vocals in general from everybody. It's hard to explain really, it really is. But that's great, I like that. With bands like this it's sometimes easier to describe the feeling, and Last City Zero feels really dark and it has an ominous, apocalyptic vibe. Well yeah. If there was one thing we wanted, no matter what music we were going to make, we wanted it to be dark. That's the one thing that was kind of planned out. And the other thing I guess we did plan out too was that we did not want it to sound like our other bands, you know? We definitely didn't want to sound like our other bands at all. You toured earlier this year, what was the reaction from fans? Were they surprised at all? Yeah, I mean, it's one of those things where they either loved it or hated it, you know? Lots of people I'm sure felt like we were going to sound like a cross between Eyehategod and Neurosis or something, which to me would be a big waste of time, why would we do that? What would be the point of that? There's so many of these, so called, like you said, supergroups out there that their new band sounds exactly like their other band, and I don't see what the point of that is really. But the fans seem to like it for the most part. But the next tour is going to be completely different, we're not doing the solo sets anymore. I mean, we can still do that, we may do that at a different show, but I think for this tour we're just strictly playing songs off the new record. People will know what to expect this time around. Yeah, yeah. But this is like a versatile band, I mean we could do just like a straight-up noise set if we wanted to. We could do that or we could do, like I said, the spoken word thing and acoustic whatever, and we have the songs. Now we have all these songs, we have the two that are on the seven-inch, plus these eight that are on here, so we've got a good set, a good hour and a half set that we could do. Because it's not just you performing vocals, did you approach writing lyrics differently for this band? No, not at all. I never even thought about that. I mean, a lot of these lyrics were already written anyway, a lot of them come from my book. Like "Last City Zero," all of those lyrics are in my book, Cancer as a Social Activity, that's the book I put out in like 2003. And then Bruce wrote some lyrics in the studio, he said they were influenced by my lyrics. But yeah, there are lyrics on this album that were written in the studio, brand new lyrics, but I didn't have any of those other guys in mind. The ones that Scott sings, he wrote those himself and like I said, Bruce wrote his own lyrics and sang his own lyrics. So the ones I had were just for me. I think Bruce does sing a few of my lyrics here and there, I can't remember which ones exactly, but they weren't written like, "These are for Bruce," you know? They were just written for whoever sang it. Oh it can be anything, I can wake up in the middle of the night and jot something down, just like a line or something that was in a dream, or something you think of subconsciously. You could be walking down the street and you see something and you write that down. It could come from anywhere. I mean, I could be watching television and see something and write it down, there's so many things that you can do with that. And then later on you can add to it or edit it or whatever and just get it to where you like it. That's pretty much it, it's not complicated. You've been writing for a long time now, has it always been like that? Yeah, for as long as I can remember. Except when we're in the studio and it's like, "We need a line for this one part, let's see what we can think of." But I've never sat down and said, "Okay, I've got to write this poem, I've got to write these lyrics," I've never done that. Except, like I said, if we needed something on the spot in the studio, but that's pretty rare, it's usually something already there and you just kind of change it around to fit. But yeah, for as long as I can remember, I mean the first things I wrote when I was a kid was just horrible punk rock lyrics [laughs], stuff about burning the flag and shooting John Lennon and stuff like that, you know? Real teenage, goofy, punk rock stuff, but it's always been the same way. Is there a specific theme tying the lyrics of Last City Zero together? Yeah, I would pretty much say the downfall of the world, in America in general. I would say that's definitely the theme. This country as it is as of today, right now, I mean this stuff was written before all this happened, but just the way it is right now, there could be a civil war, you know? I would not be surprised if civil war broke out in the United States. I mean, who knows? People seem to be too lazy today to do anything like that or are apathetic about stuff like that, but things seem to not be that great as far as poverty and corrupt police, judges, lawyers, the list goes on and on and on. The track "Last City Zero" is particularly interesting lyrically because it's a spoken word approach, and there's not much going on instrumentally, so the lyrics are much more prominent. Is there a particular message that you wanted to convey with that track? The same thing, basically, just the state of the people and the state of this country. I would call that song "Americana," like that's usually a genre that's like folk music or it's always something from the roots music of America, but I would say those lyrics are like the roots of this country right now. Just like I was saying before, the state of things is not very well, this country is very sick right now, sick in the head, it doesn't seem to be getting better. I look at all these different types of people and I just don't see how it's going to be fixed, with racism and everything that's involved. It seems to be a long road if we're all going to be a peaceful, happy country, where everybody's got the money and a house and everything. I don't even see that happening anytime soon. I do have a glimmer of hope though, I do hope things get better, but usually I'm pretty negative about things, so who knows. There's definitely no shortage of lyrical inspiration on that front. You've been doing this for a while now, especially with Eyehategod for a long time and you also have Arson Anthem and now Corrections House, and you've dealt with a lot of struggles along the way. Where do you find the drive to keep going, to keep creating the art that you make? I really don't know [laughs]. I don't know, it's just the way I was made, I guess. I just always like to create stuff, especially music or anything like that. I mean, I've been in bands since I was 15 years old, you know? It's been a long time, I've been actually playing in bands and writing lyrics, so I don't know, it's just there. But I find that the struggles you go through make you more creative too, so it all flows from there. No, no. There's no point. I mean, this is my life, I've lived it the way that I've lived it. What would I go back and change? I mean, it could be miserable, who knows what's going to happen? So no, I wouldn't change anything, I would leave it just the way it is. I mean, of course I don't want people dying around me and stuff like that, I don't want to be homeless or anything like that, but those are things that happen in the world, sometimes you can't help things like that. The best art seems to come from people who have been through some pretty dark times. Yeah, that's usually where it comes from. I mean, it's like these comedians, it's a totally different thing, they're making people laugh, but usually those are some of the most miserably depressed, dark people in the world [laughs]. They come up with this great stuff from their pain, you know? And I think it's the same with musicians as well. Bill Hicks comes to mind when you mention that. Oh yeah, he's definitely one of my favourites. I'm a big fan of comedy stuff like that. Doug Stanhope too, I'm sure you've seen him. I'm a big fan of that stuff because the whole art of getting up there by yourself and just doing this whole thing, it's crazy, you know? I just admire those people a lot. What does the future hold for you? You mentioned Corrections House will be touring again soon? Yeah, we're going on tour in December in Europe. I love to travel, I love touring. I know some people that don't like it and I'm like, "Why are you in a band? Didn't you get in a band so you could see the world and go places you never would think you would go?" I don't know, some people just don't like to tour, but I love it. Corrections House goes to Europe in December, it'll probably mostly be Germany, Holland, UK. I don't have the dates yet, but those are the usual places. And then we're going to try to do a tour in America sometime when we can all get away from doing other things. Our schedules are always kind of crazy, we're always going back and forth with the schedules because everybody's doing their thing too, everybody keeps as busy as they possibly can. Will Eyehategod continue on? Last year you were planning on recording a new album. Has that been put on hold? Well, of course. I mean, not on hold, we've got somebody mixing it right now. It's just being mixed in another city and we like to be there when people mix our stuff. So a new Eyehategod album has been recorded? Yeah, yeah, 15 songs. We recorded 15 brand new songs, it's just got to be mixed and mastered and we've kind of got ideas for artwork and stuff. But we still haven't picked a label yet because we just don't trust record labels [laughs]. It's just something that's hard to do, for me. But we have offers, we're just waiting to see what happens with that. It was announced that Dale Crover (Melvins) will be filling in on drums at the Housecore Horror Film Festival and that it will be a tribute to Joey LaCaze. Was Dale a natural choice, being that he was an influence of Joey's? Yeah, of course, that's the whole thing is that he was Joey's favourite drummer. Well, one of his favourite drummers. Mitch Mitchell from the Jimi Hendrix Experience was another one and he was a big Keith Moon fan too. But yeah, with Dale, we've known him for a long time and he kind of threw the idea out there, I think. I'm not sure how it all started, but somebody asked me if that would be cool and I said, "Of course," and then Jimmy [Bower, guitarist] talked to him. It' just the one show, but it should be great, it should be fun.